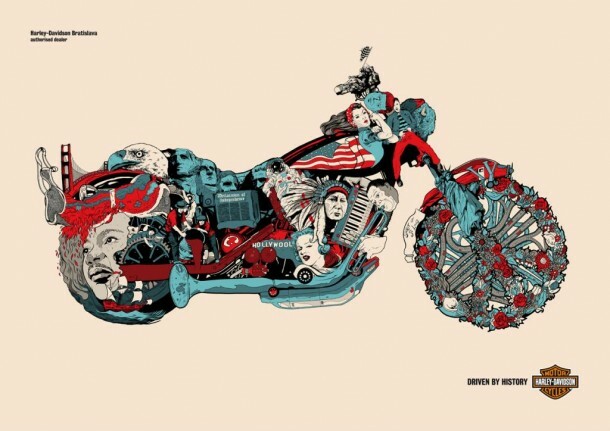 Although most illustrators use their own very personalized method for handling assignments, other commercial visual professions, such as graphic design, industrial design, and interior design follow a more structured method of project development and completion. 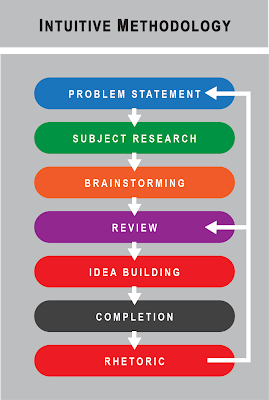 Being aware of a form of structured project methodology can provide an additional understanding of what goes into solving a problem, A methodology can greatly benefit illustrators, for what is required for illustration problem solving is very similar in structure to that which is required by other visual communication disciplines. Before going any further, a few terms that are used to describe this process should be defined to better understand project methodology as it pertains to illustration. 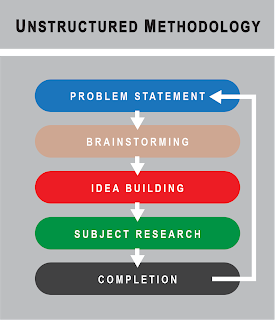 Methodology - meth·od·ol·o·gy, a system of methods used in a particular area of study or activity. Ideation - i·de·a·tion, the formation of ideas or concepts. Brainstorm - brānˌstôrm, a way to produce an idea or solve a problem through a sudden spontaneous inspiration. Rhetoric - rhet·o·ric, the art of speaking or writing effectively. There are many variations of project methodologies that cover an array of different types of projects from visual image development, to conceptual content development, to project management, and so on. The structured project methodology presented here has been tailored to illustrators and is a comprehensive progression of activities that reflect all aspects that go into completing a typical illustration assignment. Presented by a client, account executive or an art director, a problem statement is usually a collection of facts and information that describe the task you have been commissioned to complete. The statement will include a problem to solve and possibly a desired outcome. This original problem statement will probably be communicated in terms that are familiar to an assignor or a client. Most likely using terms that are non-artistic. Additionally, the problem statement may be received either directly from a client or indirectly from some other individual subcontracted by, or representing a client. After receiving a problem or assignment from a client it will be necessary to reinterpret the problem. A problem restatement is a translation of the original problem into terms or standards an illustrator is familiar with, i.e., terms that apply to the creative idea development, and illustration visualization and production processes that are used to develop a solution. This is the stage in which to grasp an understanding of the assignment. It is also the time to obtain further information from the client if necessary. Brainstorming is the basis that provides the raw materials to construct an idea. Most importantly, brainstorming should be a non-judgmental recording of any and all ideas, thoughts, associations, experiences, impressions, etc., about the problem subject in generalities. 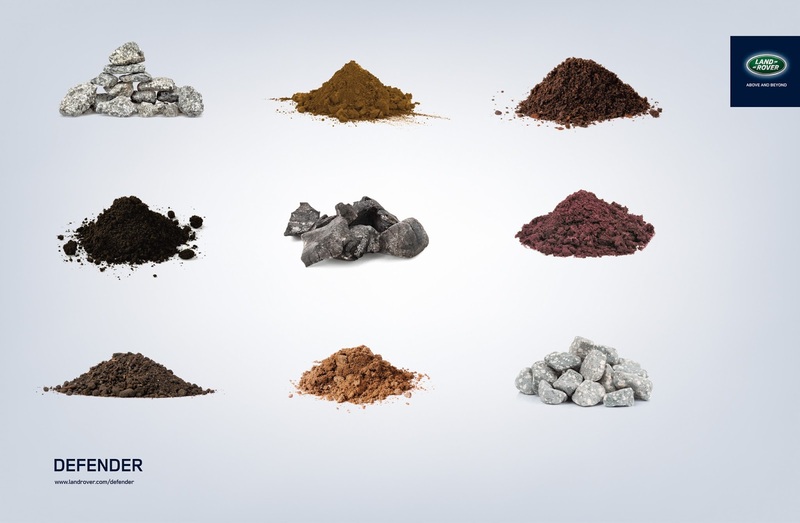 The materials generated by this activity will become the building blocks of further ideas. The record of this activity may take the form of verbal notes and/or visual sketches. For brainstorming to work best the thoughts must be put on paper. Also, during this stage of creative gathering, no thoughts should be discarded. From a brainstorming session, the next stage in creative gathering is focused brainstorming. Still non-judgmental, this is the stage to search for any ideas that are independent of the first brainstorming session. The main difference is that in this session thoughts and ideas are developed that relate more specifically to the original problem statement than to just the problem subject. Focused brainstorming is used to improve and broaden an original set of ideas. Researching a subject performs the valuable role of eliminating stereotypical ideas concerning a subject such as previously publicized phrases or visuals, or even misconceived notions. Research is necessary to become familiar with the subject of a problem especially if it is something that requires a specialized set of knowledge. Research or information about a subject can be personally sought out or a client can supply it. At all times during a process involving research, the purpose is to learn more about a problem or subject, to add to a cache of ideas. Less self-explanatory than subject research, media research relates to the functional requirements of the assignment. This includes production processes and materials as they relate to a specific purpose of a project. Medium research impacts how an illustration needs to visually be prepared or appear, rather than what the concept of the image will be. Budget becomes an extremely important consideration here. Media research provides information about any visual limitations or opportunities that may also factor into the conceptual development of an assignment. The review stage is when assignment solutions are assessed for their aesthetic or conceptual value and evaluated for presentation to a client. The purpose of a review is to confirm the appropriateness of a idea and to classify it for presentation purposes. It is desirable to place classifications on the ideas such as practical, attractive, unique or this one the client suggested. Ideas that are personally appealing to the illustrator, or may have a future added value to the client should also be included. Criteria review is when ideas are re-evaluated and related to the requirements of the problem statement. This stage provides an opportunity to search for unique qualities that may be inherent in an idea. Or ideas that may lend themselves to added benefits such as an illustration that is versatile, easily produced, more marketable, or one that can sponsor further conceptual opportunities. 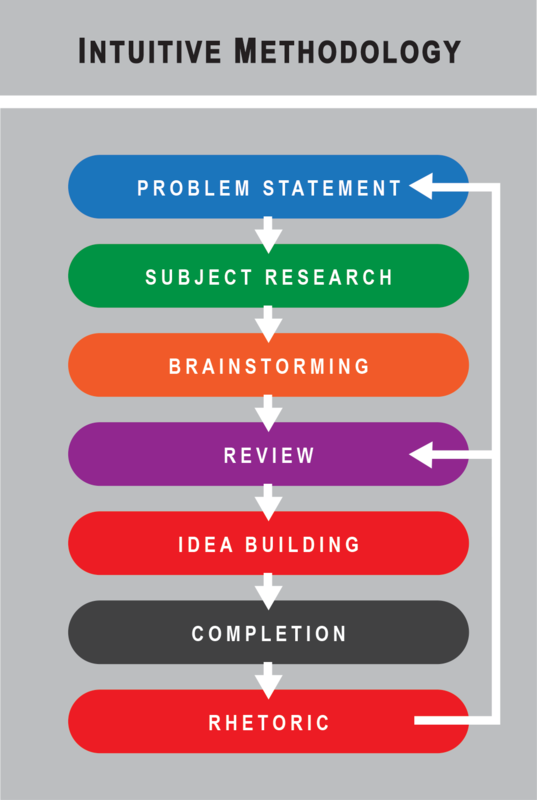 Idea building combines selective pieces of the recorded material that was generated from the brainstorming and research stages to form a more complete set of conceptual interpretations to develop as possible solutions to the assignment. Idea building is the stage where concepts are prepared for review and presentation. 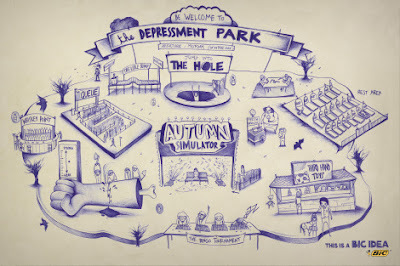 To implement idea building, sketches are produced that illustrate the concept for presentation to a client. All formal illustration and design and considerations are finalized at this stage; composition, visual subject choices, typography (if needed), etc. Tone and color can be indicated if they will help a client understand the sketch and concept easily. Rhetoric supports the results of concept development and sketches produced in the idea building stage. Based on conclusions drawn during the review stage, it is used to explain and justify the artistic choices and conceptual intent of the sketch proposals. However, it can also influence and inform the idea building process. Rhetoric being a verbal form of communication is an effective way to connect with non-visual clients. It is used to answer any questions or concerns that may arise from the appearance of a sketch. It is not enough to be able to intuitively produce a pleasing idea, it must also be sold, and it in turn, if presented to a middle manager, the idea may have to be presented by a middle manager to a superior, a constituent, or a client, and so on. 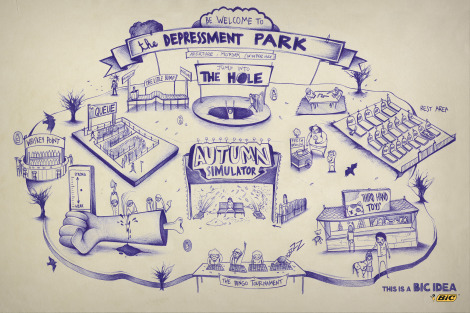 Also, this may happen without the illustrator being present. The completion stage is where approved ideas are prepared for delivery to a client and or a production house, i.e., the execution of the final illustration. It is also where any changes and/or revisions to the final illustration are added as a result of the final review. An extremely important stage prior to the release of an illustration, the final review is essentially a quality control assessment and inspection of the finished illustration. It is the time to look it over the work very carefully to make sure it will satisfy the expectations of the client. Anything bothersome can be corrected before the illustration is delivered. It’s the last chance. Still retaining some semblance to a fully structured methodology, the intuitive project methodology corresponds to the more natural intuitive approach to problem solving that many illustrators use to complete assignments. At first glance, intuitive problem solving appears to be a streamlined, more efficient version of structured methodology, retaining at least one aspect of the problem identity, ideation, research, evaluation, development, and production stages. However, because there is far less cross-referencing of the six methodological stages, the result may suffer from lost creative opportunities, and a much more rudimentary solution to an illustration problem. Rhetoric, which a vital part in the problem solving process, is used only for purposes of justifying the completed work. Used in this way, rhetoric no longer influences and informs the idea building process. Although seemingly not a methodology at all, an unstructured approach to problem solving is none-the-less still a form of methodology. 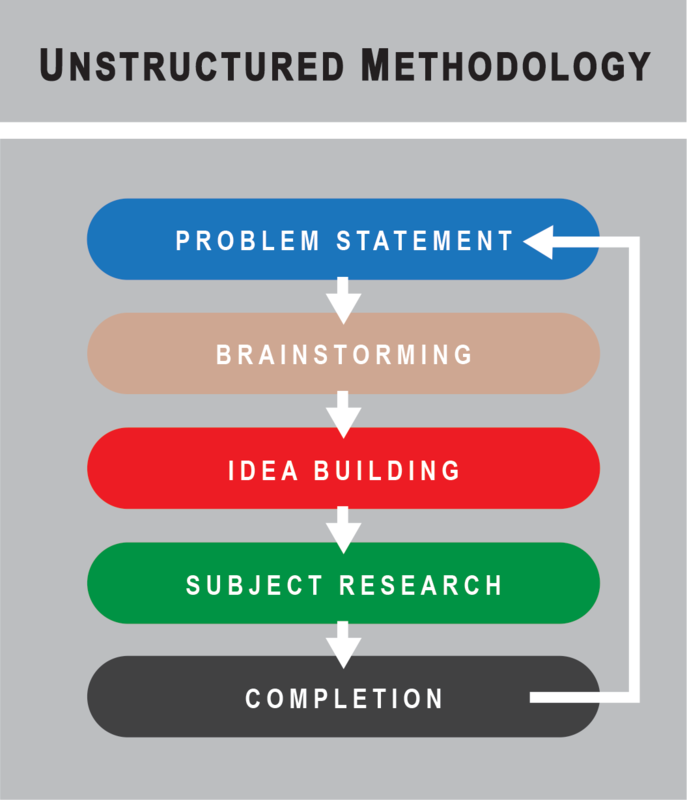 The unstructured project methodology occurs when a problem is dealt with by thinking only of the task at hand. Ideating a concept without considering what will happen next or what has occurred prior, or researching a subject after the idea has been built. There is little or no cross-referencing of stages and far less discovery and development of creative building blocks. In fact brainstorming may not even be used in unstructured problem solving. It is essentially coming up with an idea and proceeding straight through to completion. This hit or miss approach to solving a problem does exactly that, hits or misses. 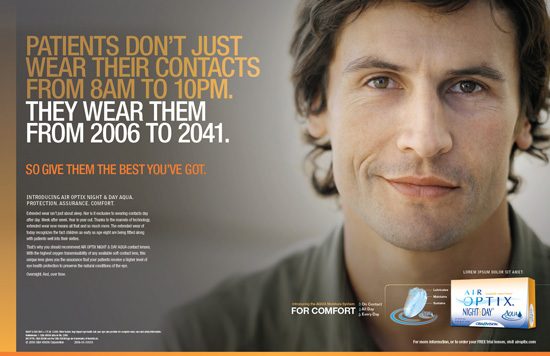 In the United States, we are exposed to some form of advertising nearly every hour of our waking day. Advertising pervades all media from printed periodicals, to websites, to outdoor billboards, to in-store displays, just to name a few. It appears on our televisions, mobile phones, computers, etc. and we hear it on the radio, through in-store announcements, and more. 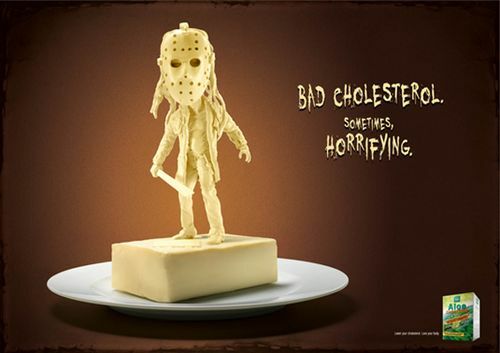 We are amused by advertisements and annoyed by them. And, most of us go about our daily business mostly ignorant about how they work. Now for the general public that may not be a concern, but for us illustrators, who must create advertising visuals, it can be a great help in our work to know how advertising works, particularly when it comes to the kind of messages ads impart. All advertising can be broken down into a finite list of techniques, and advertisers rely on them not only to help structure an approach to an advertisement or campaign, but also to sell the creative concept underlying it to a client. 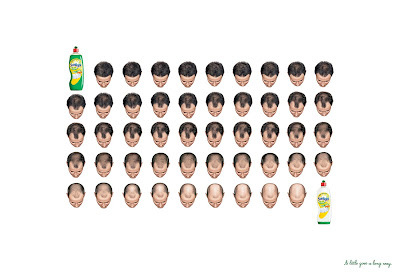 Advertisements can utilize one isolated technique or can combine more than one to present a concept. Always a very popular and entertaining technique, animation is used to bring life to inanimate, static products and subjects. It is also used to interject a visual narrative to an advertising concept. 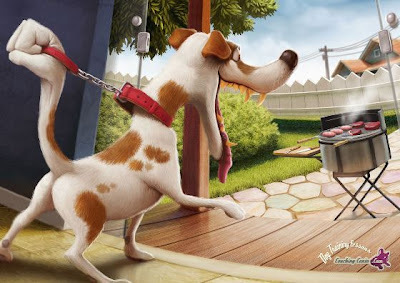 The animation technique applies another meaning to a subject by exaggerating, adding to, or enlivening the physical characteristics of a product or subject by altering its form, setting it in motion, or bringing it to life. Purpose: To create an entertaining, attention getting, advertisement by emphasizing something that is out of the realm of ordinary experience. Example: The use of Pillsbury's animated Doughboy, and the Eveready bunny. "Whatever life breaks up." 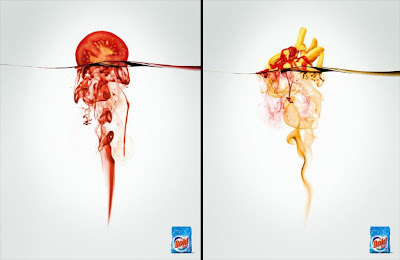 Client: BiC Bond. Agency: BorghiErh. "Dog training lessons." Client: Coaching Canine. Agency: CB Grey Paris. "Gripping performance." 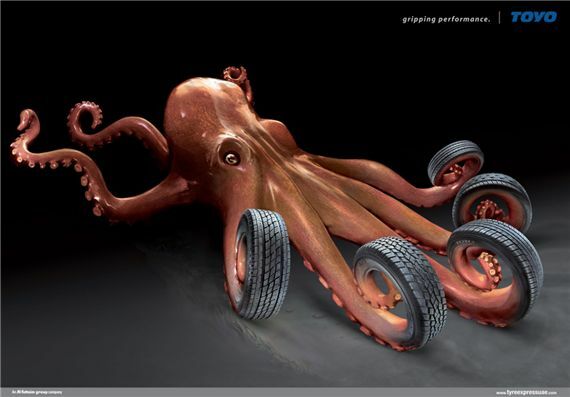 Client: Toyo Tires. Agency: Gmasco Agency. 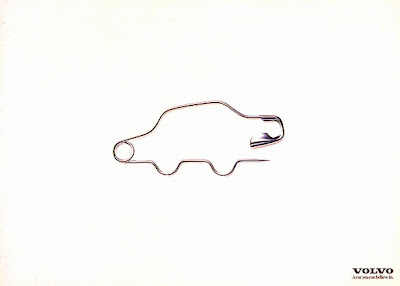 Effective at drawing a viewer’s attention, analogy is a conspicuous technique that is called upon for products and subjects. 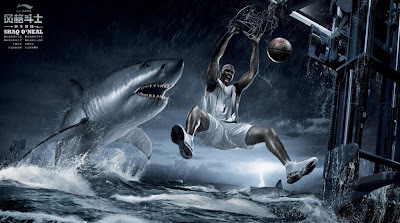 Although it most commonly accomplished by way of visual appearance, it can also be conveyed through conceptual content. The technique is achieved by presenting a comparison between two or more objects, or subjects that are similar. Purpose: To create a situation in an advertisement where the superior aspects of the one product, subject, or opinion can be brought out by comparison to another like product or subject. Example: Wendy’s ad comparing the Bacon Cheeseburger Deluxe to an unnamed inferior burger sandwich. "Say no to anorexia." Client: Star Models. Agency: Revolution Brazil. "Much more for less." Client: Buenos Aires Zoo. 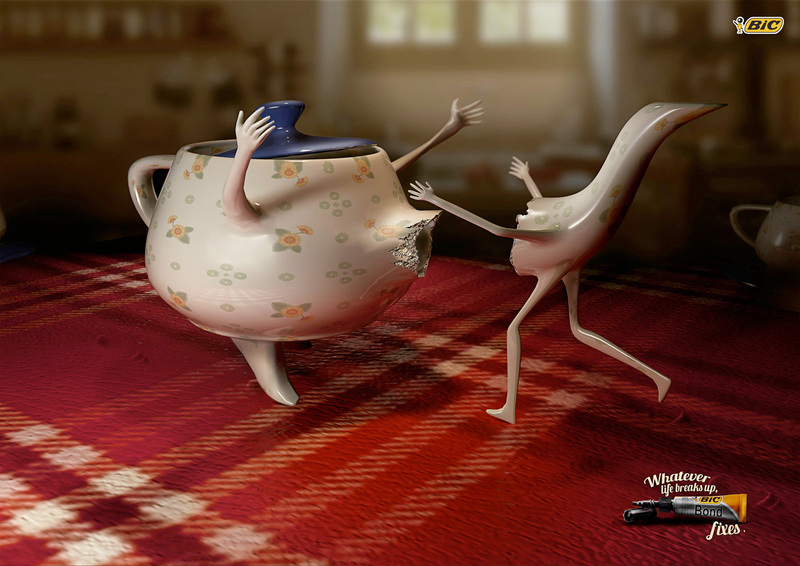 Agency Saatchi & Saatchi. Celebrities are always able to grasp the attention of the general public, so using them to endorse advertisements is only natural. Products and subjects can benefit greatly by tapping into the influence celebrities possess among audiences. The celebrity sponsorship technique uses a famous figure such as an actor, politician, athlete, media person, etc., to present, or pledge support for a product or subject. Purpose: To affect the transfer of trust and admiration the audience has for a celebrity to the product or subject within an advertisement. Example: Using William Shatner for Priceline.com, the Kardashians for Sears, and Martha Stewart for Macy's. "Slam dunk." Client: LiNing Shoes. 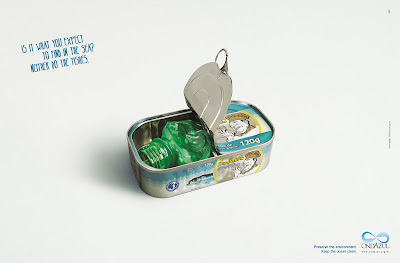 Agency: Leo Burnett Worldwide. Similar in visual appearance to the analogy technique, the contrast technique is actually the opposite. It presents a comparison between objects or subjects that are dissimilar. The contrast technique can also closely relate to the symbolism technique except that it presents the comparison by showing two or more objects, or subjects, whereas symbolism usually presents itself visually as a single subject or object. Purpose: To create a situation where the characteristics of a dissimilar object can either be associated with, or juxtaposed to, a product or subject. 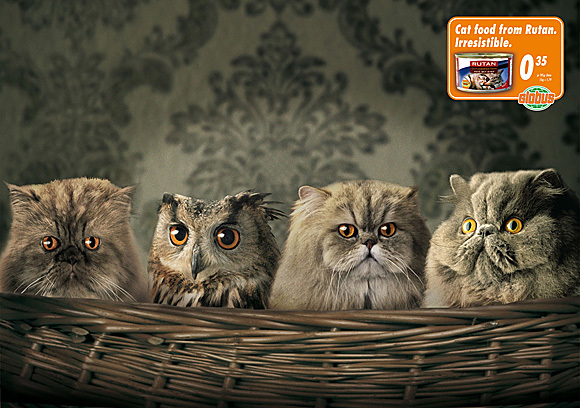 Example: Advertising that compares dog and cat food to human food. "Lego." Client Lego. 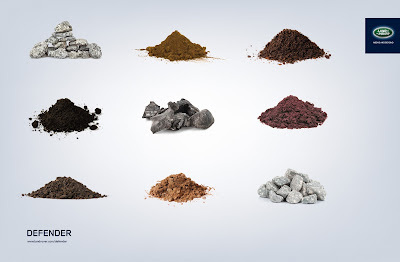 Agency: Blattner Brunner. 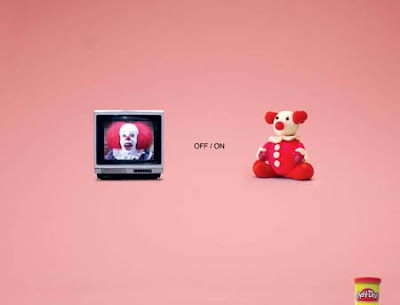 "Off/on". Client: Play Doh. Agency: Grey Advertising. More of a content classification than a technique, corporate responsibility presents information about the social interests of a corporation as opposed to the products or services it provides. 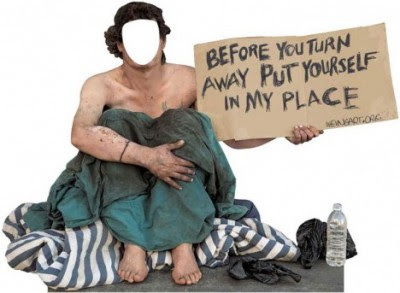 Corporate responsibility advertisements are meant to gain and reinforce pubic support for acts of goodness, or to counteract public condemnation for unpopular business practices or occurrences. Purpose: To present a corporation in a favorable light by informing the public about corporate activities that are beneficial in some way to a society. 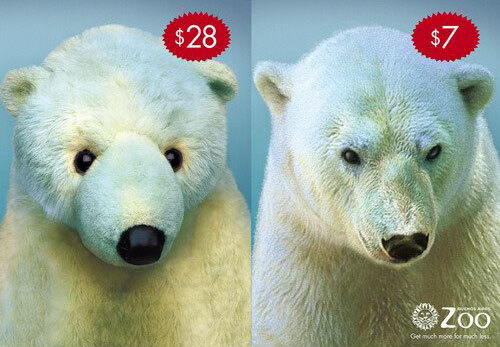 Example: BP’s ads to counteract the unpopular PR that resulted from the Gulf of Mexico oil spill. "Keep the ocean clean." Client: Ondazul. 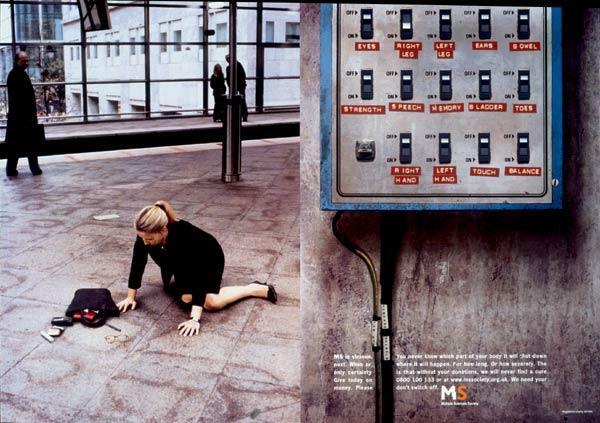 Agency: Que Advertising. Traditionally a person-to-person way of marketing, a demonstration presents a tutorial on a product or service. Now in either a broadcast or published advertising venue, the demonstration technique shows an audience how to use a product or subject to emphasize its advantages, or to explain how a product works. Purpose: To increase audience understanding of the subject and sell the ease of use of a product. 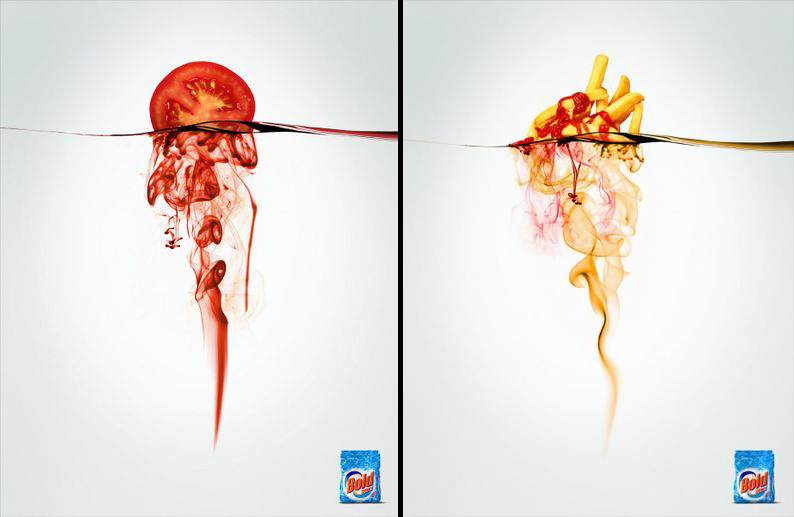 Example: Showing how Oxyclean Detergent get out stains and brightens laundry. "One story, two points." 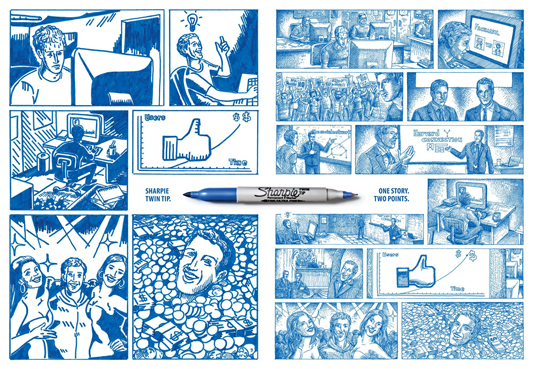 Client: BiC Sharpie. Agency: DraftFCB. "Bold." 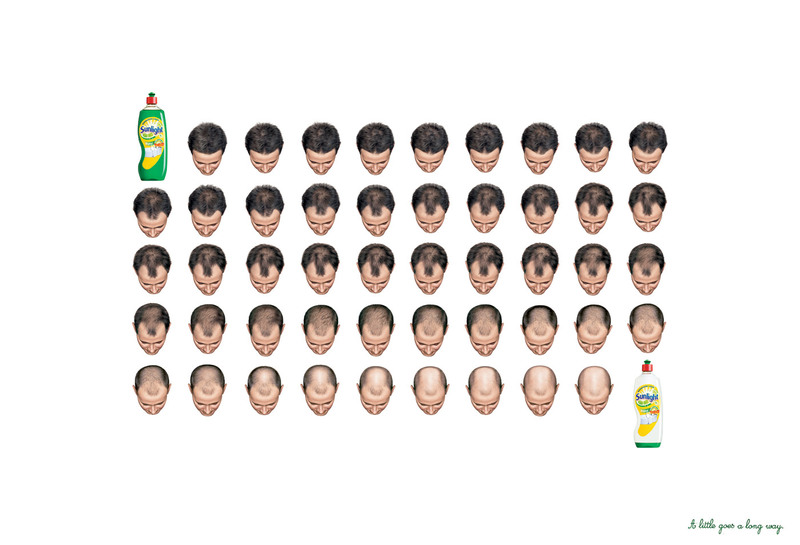 Client: Proctor and Gamble. Agency: Grey Advertising Chile. 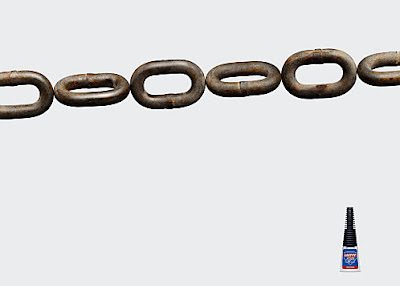 "Chain." Client: Loctite Glue. Agency DDB Italy. 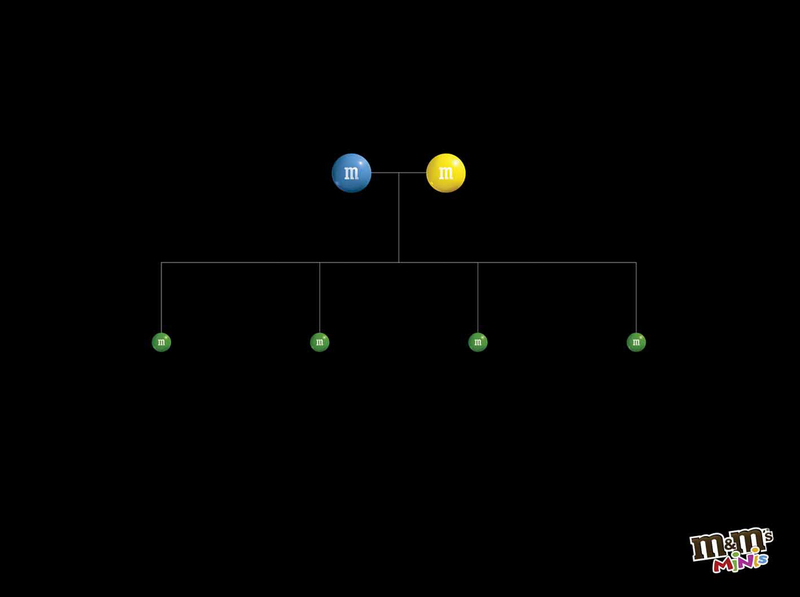 The diagrammatic technique presents information about a product or subject in a visual diagrammatic structure. The content of the diagram can be in the form of pictorial elements, an index, or word call outs, that define an idea or an existing visual. When a graphical organization of material is presented, it is sometimes known as a scientific technique. The purpose of the technique is to organizationally define the product or subject directly and analytically. Purpose: To present an outlined or systematized display of aspects of a product or subject in an advertisement to educate a viewer. Example: Pharmaceutical product ads that show and label aspects of cutaway views of organs. 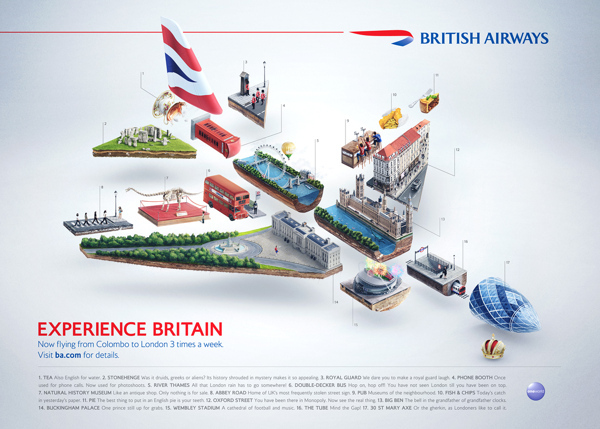 "Experience Britain." Client British Airways. Agency: BBH Singapore. The familiar technique attempts to seek a comfort level within a viewer by presenting concepts and content they are already familiar with to foster an affinity with a product or service. The technique presents an object, phrase, or situation that is familiar to an audience for the purpose of association with a product or subject. Purpose: To create an empathy and familiarity with a product or subject to foster the idea of friendship within an advertisement. Example: Commercials that use phrases such as "like Mom's apple pie”; “like mom used to make"; "in the beginning God created heaven and earth", and any allusion to Elvis. "Best coverage worldwide." 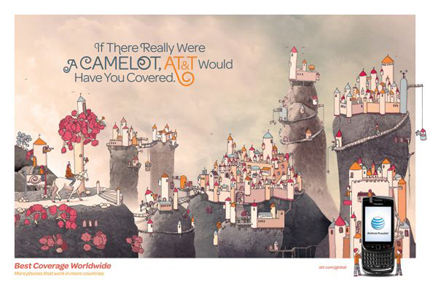 Client: AT&T. Agency BBDO. "Wake up." Client: Pilao Coffee. Agency: Talent São Paulo. Memories can reflect many happy and enjoyable experiences, and the nostalgia technique makes the most of these emotional associations within a viewer’s memory. Also used to educate, the nostalgia technique can also be a presentation of historical information about a product or subject. It uses an object, phrase, situation, or information from the past to promote an association to a subject or product for a viewer. Purpose: Same as the familiar approach, but mainly to force positive associations with the subject through memories of past occurrences or history. Example: Travelling from the US to Europe is like travelling back in time. "Everything ages fast." Client: Maxi Media. Agency MoMa. 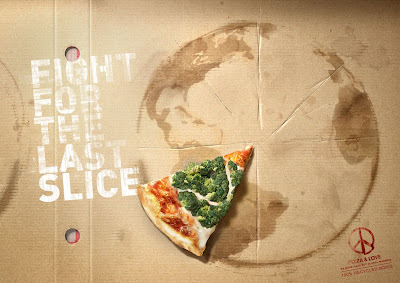 "Big ideas begin with pizza." Client: Dominos. 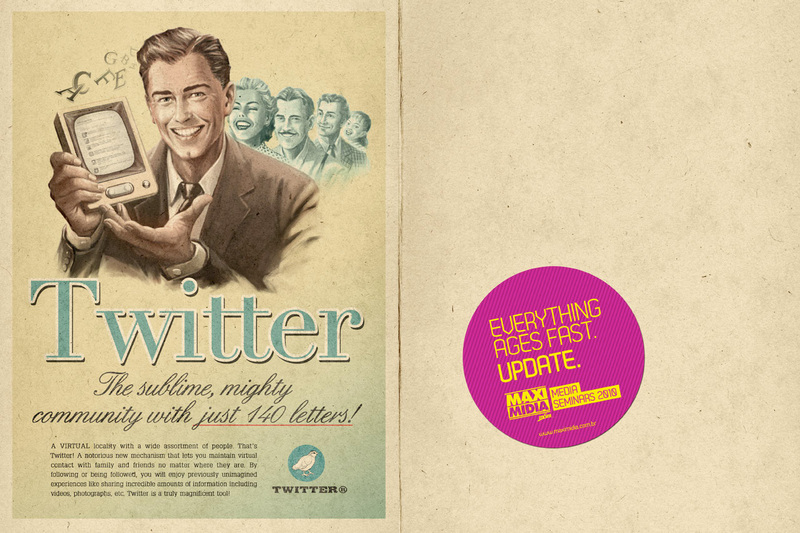 Agency: McCann Erickson. 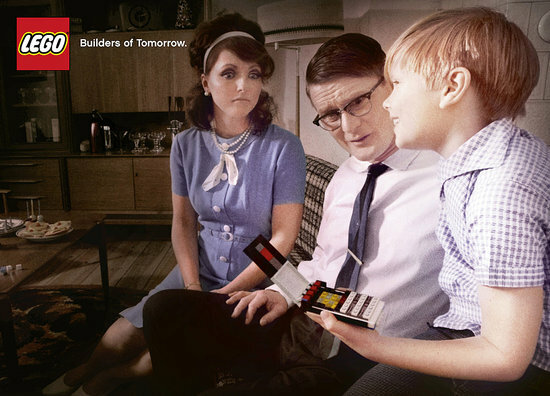 "Builders of tomorrow." 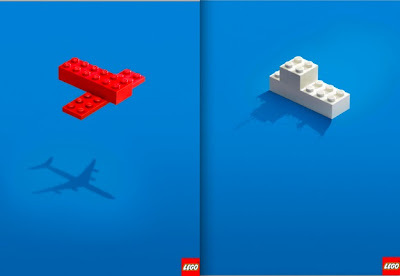 Client: Lego. Agency: Serviceplan Munich. 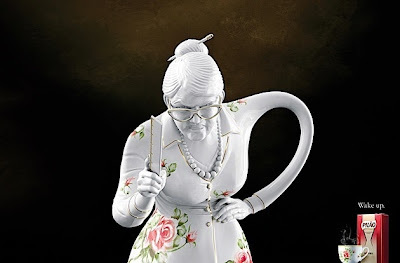 An old salesperson’s technique was to get the customer physically involved with a product or subject, allowing them to hold a product, feel its sturdiness, etc. 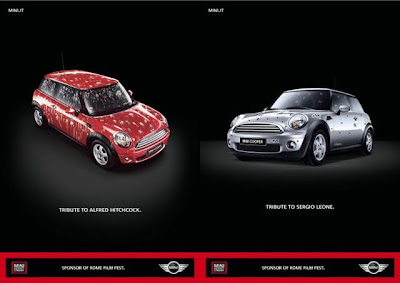 Although the sales person is no longer present, an advertisement can create a similar effect by utilizing a participation technique to directly involve the viewer in the ad concept. This technique creates a situation that requires the viewer to perform some kind of a physical task. Purpose: To get an audience physically involved with the product or subject. The time required to complete the task becomes valuable selling time by producing more exposure to the ad content. Example: Coupon ads, direct mail, picture puzzle ads, rub-offs, peal-ups, etc., that necessitate some physical activity on the part of the viewer. "A burst of sunshine." 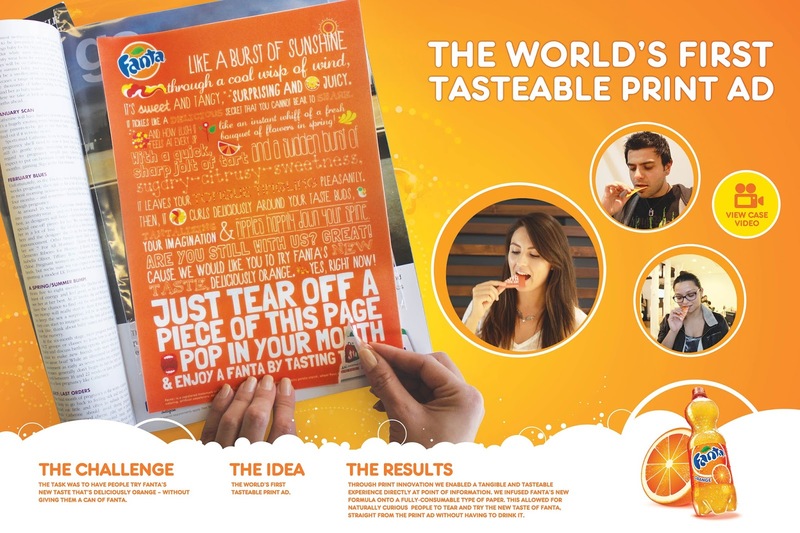 Client: Fanta Beverages. 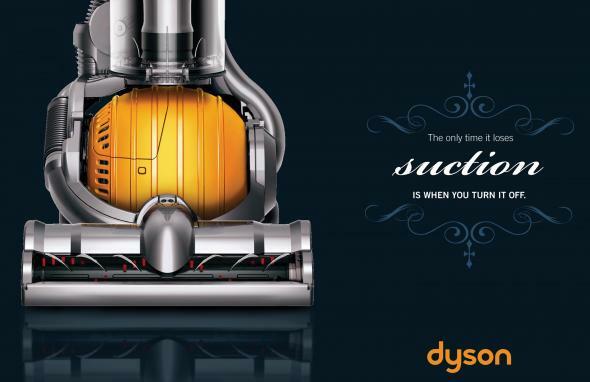 Agency: OgilvyOne Dubai. Similar in emphasis to a testimonial, the personalization technique relies on a person or group of people to engage, i.e., be presented to a viewer directly, or by way of a dialogue. The technique works by relating a product or subject to a viewer’s personal experience by making eye contact or by talking directly to the viewer about an experience. Purpose: To capture the audiences attention by speaking directly to a viewer, eye to eye, so to speak. The advertisement can also to appeal to a viewer by relating an experience in a personal manner. 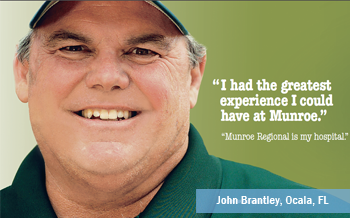 Example: Banks and Investment firms like Edward Jones where a broker addresses the viewer directly. 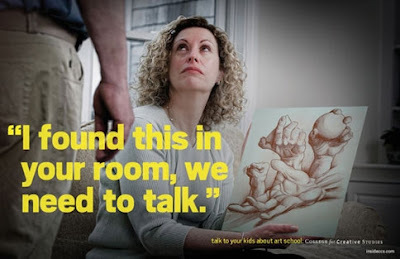 "Talk to your kids about art school." Client: College for Creative Studies. More of a cinematic technique in television commercials, and a photo album approach to print advertising, sequences present a collection of snippets that build up to a single overall impression about a subject or product. Sequences show a series of images that present different aspects of a subject or product, randomly, systematically, or in progression. Purpose: To give the audience a general overview of a product or subject or its use, or showing an environment associated with it. Example: Dyson Vacuums, Sea World, Wait Disney World, Movie Previews, Taco Bell, Budweiser, Coors where there are multiple views of products, subjects, and/or situations. "A BiC idea". Client: BiC. 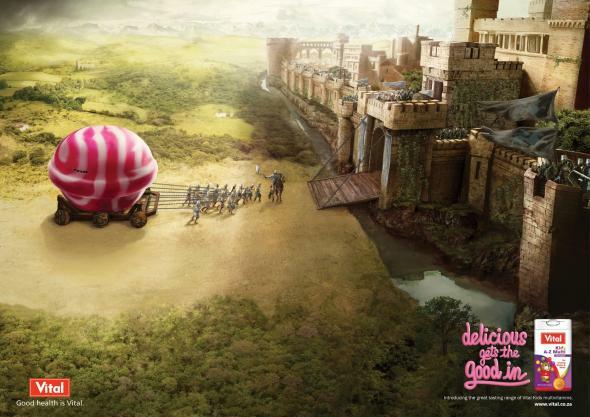 Agency: Publicis Spain. "A book can change your life." 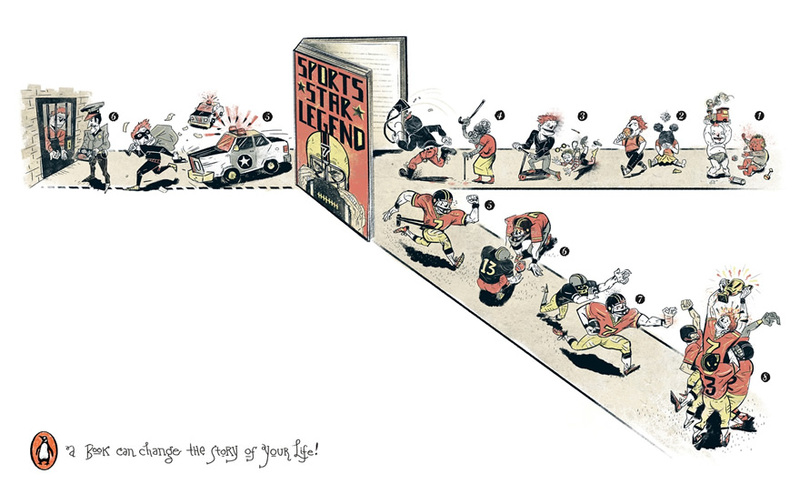 Client: Penguin Books. Agency: Y&R Bejing. "Above and beyond." Client: Land Rover. Agency: Greekvertising Athens. "Irresistible." Client: Routan Globus. Agency: Ogilvy & Mather. Slice of life is a technique used by advertisers to present an actual real life event. As the name suggests, it takes an interesting moment out of a person’s life and cuts it into an ad or commercial, something an audience can relate to through life's experiences. The original intent of slice of life was to use a real event to support an association with a product or subject. It is also now referred to as a reality TV approach, although it exists in print advertising, as well as TV. Additionally, fictitious versions or recreations of real life experiences are also used. 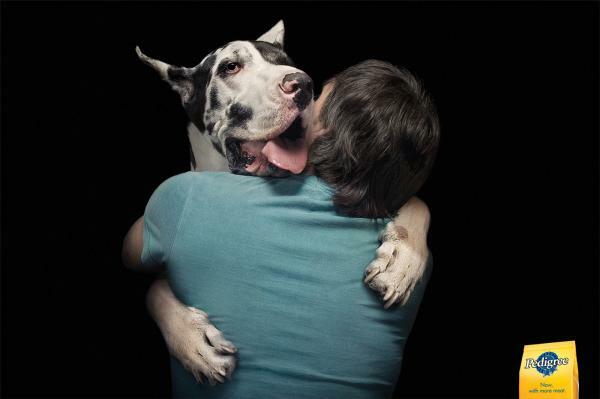 Purpose: This method of advertising more than any other is meant to convey an emotion to the audience. 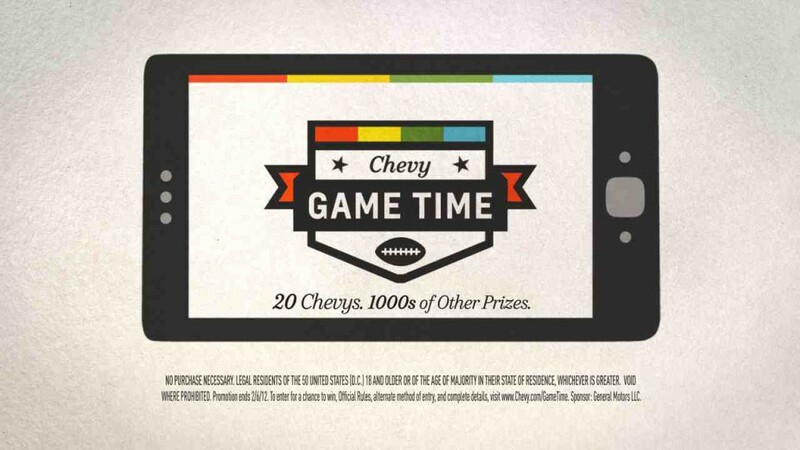 Example: Advertisements that take an impromptu, cinema verité, or reality TV approach to a product or subject. "Pedigree." Client: Pedigree Dog Food. 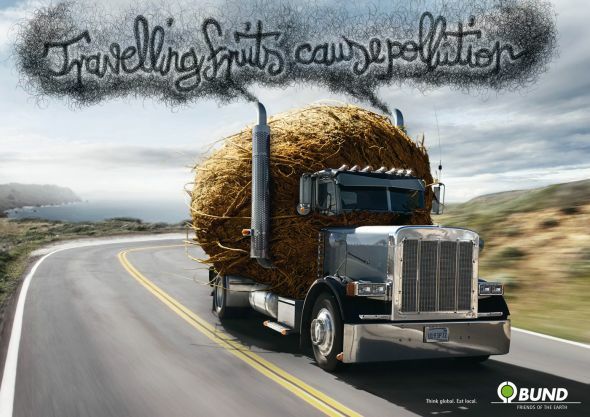 Agency: Savaglio\tbwa Argentina. 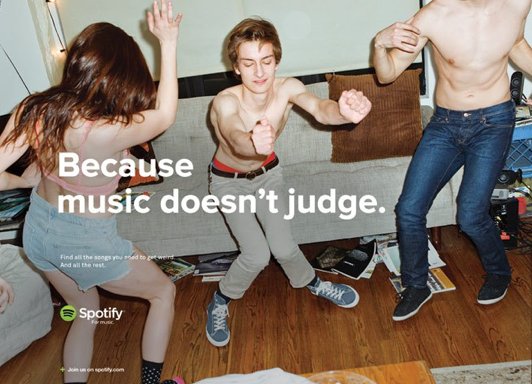 "Because music doesn't judge". Client: Spotify. 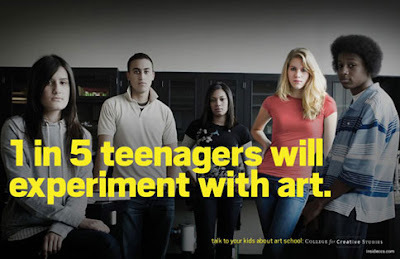 Agency: Droga5. "Karate for kids." Client: Ninseikan Karate School. Agency: Y&R Tokyo. Symbolism can improve the speed and comprehension of a complex or difficult concept by using objects to symbolize concepts. The symbolism technique presents a kind of visual shorthand that takes advantage of something that is already in a viewer’s consciousness to explain something else that is not. 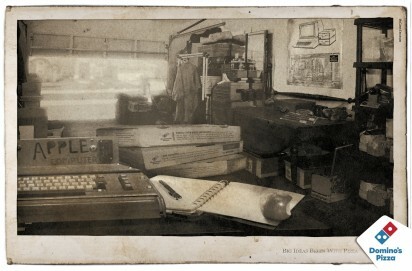 The objects may or may not show a direct relationship to a subject or product. Purpose: To reinforce associations to a product or subject through associations with the symbolic object. Example: The famous advertisement "This is your brain on drugs," with a frying egg used to simulate drug abuse. 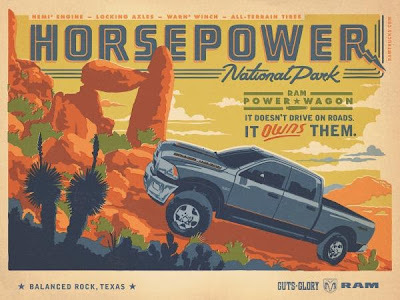 "Driven by history." 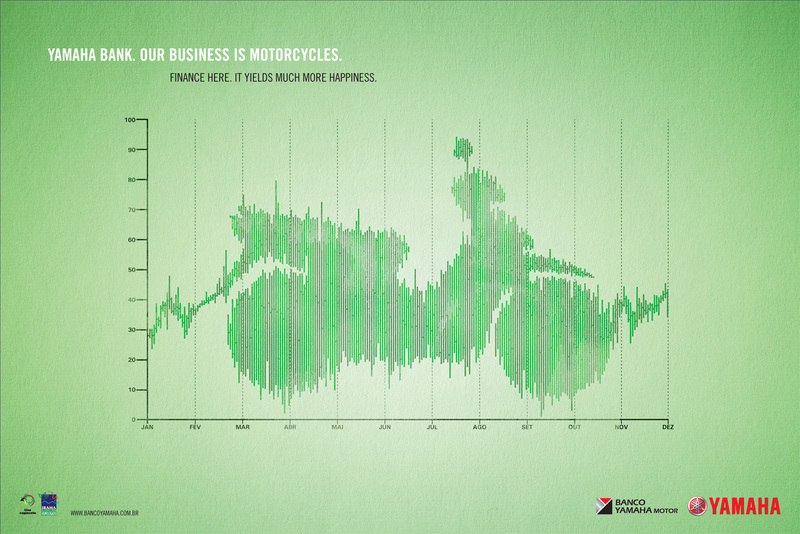 Client: Harley Davidson. Agency: JANDL Bratislava. "World food day." 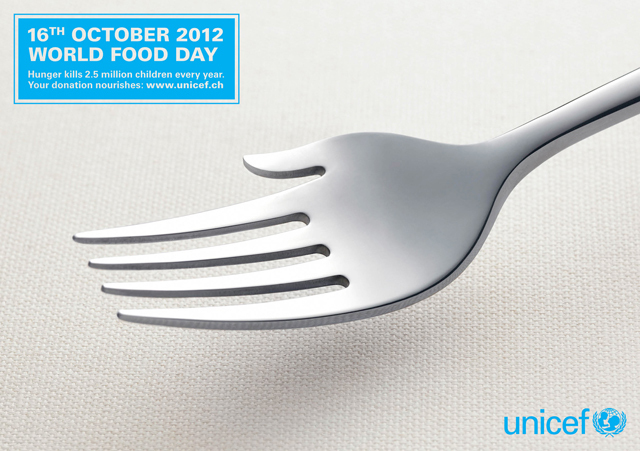 Client: Unicef. 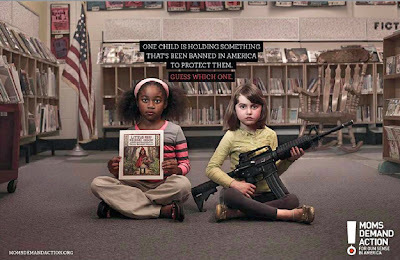 Agency: Saatchi & Saatchi Switzerland. "Switchboard." Client: Multiple Sclerosis Society. Agency: Saatchi & Saatchi. Simulating “word of mouth” advertising, a testimonial is a recommendation in the form of a statement by a customer, subject expert, or a participant. It can also be presented in the form of a testing or sampling situation, made on the behalf of a product or subject. Usually done with non-actors, or existing product or service users, the testimonial can be in the form of a “man on the street” type of impromptu interview. Purpose: To reinforce honesty in advertising, also to increase trust in the subject or product. Example: A satisfied customer endorsing the effectiveness of Excedrin.
" The View From Onandaga." Client: Onandaga Community College. 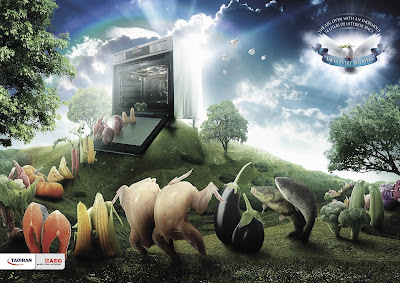 Agency: Latona Paul & McCann Advertising. 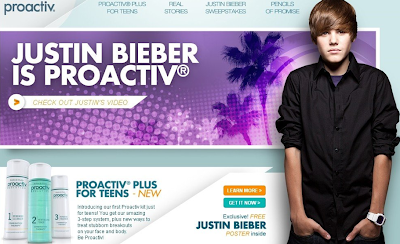 "Justin is Proactive." 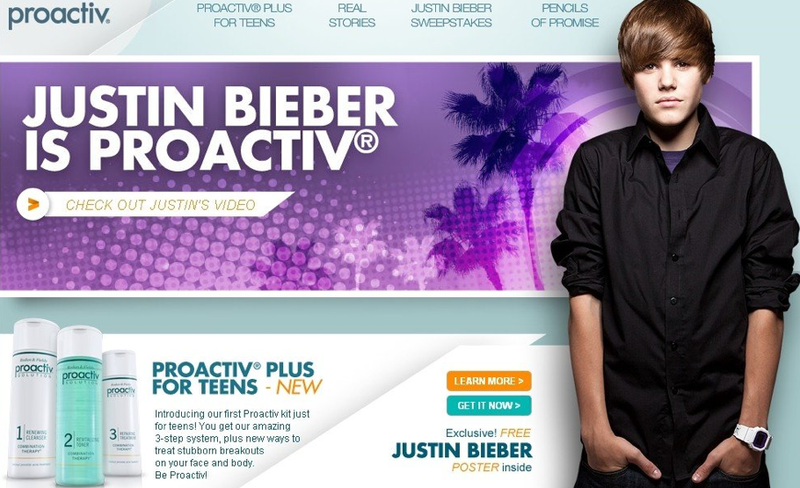 Client: Proactive. Agency: CI-Group. Although not a technique per se, a unique selling proposition is so sought after as a way of advertising a product or subject that it becomes a driving force that influences the design of a product or service itself. A unique selling proposition emphasizes an aspect of a product or subject that other competitors can't. Alternatively, it can also happen by making a statement about the product or subject that other like products can't make. A unique selling proposition sometimes has the power to revolutionize an industry. *Purpose: To set a product or subject above the field of competitors with an exclusive feature. Example: Chevy the highest gasoline mileage cars in America. Aleve, the only eight-hour pain remedy. Wendy's original dollar menu. *Note: Unique selling propositions involve the content of a message rather than a technique for presenting a product or subject. They are usually combined with another advertising technique. 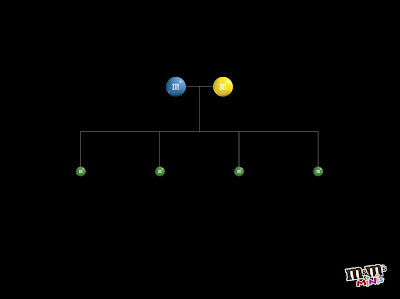 "M&M's minis family." Client: Mars. Agency: BBDO Proximity Malaysia. 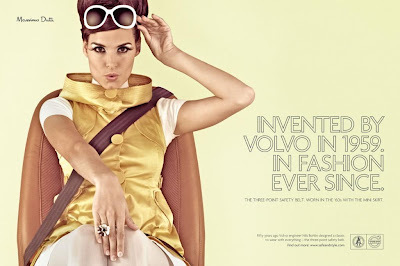 "Volvo in fashion." Client: Volvo Ford. 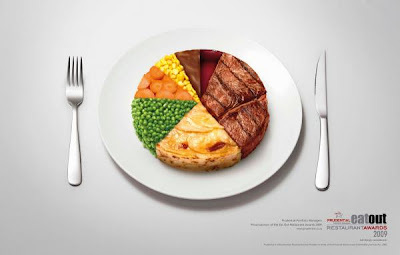 Agency: Memac Ogilvy & Mather. "No loss of suction." Client: Dyson. Agency: Vallance Cruthers Coleman.